Marital Status: Married to Eleanor Hogarth. N.B. All quotes taken from the Yearling UK TV Guide Web Page except for the last one which I got from David Renwick himself! 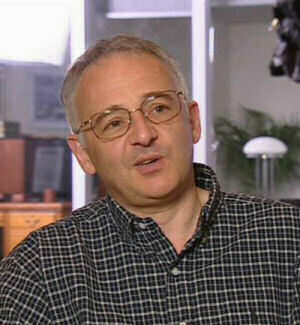 David Renwick is the mind behind Jonathan Creek, and boy does he have a great one! David is better known for his work on the UK television show One Foot in the Grave starring Richard Wilson, one of the UK greatest comic talents. However David has also written serious drama in the shape of Agatha Christie's Poirot, adapting some of her short stories for the small screen. David has also worked for the Two Ronnie's, writing some 50 monologues for Ronnie Corbett. "Susan Belbin and I had for years mused over the possibility of coming up with what we called 'a British Columbo'. What we both loved about 'Columbo' was the fact that, in contrast to all the other American cop shows, it was about ideas, and characters, and this wonderful, elaborate puzzle. As opposed to chases and kicking doors in and climactic shoot-outs every week. Although you always knew who did it from the outset, what kept you hooked was how he would manage to nail the killer, with some ingenious - often quite chilling - coup de grace'." A annual trip with his father to the Magic Circle Festival, helped David create the character of Jonathan Creek. However he didn't do any in-depth research into magic and tricks. "Beyond a little extra reading I've done no major research for this series........if you're not careful you get bogged down with too much referential realism and you lose sight of the creative process. For this reason I've never been a great researcher, I tend to rely upon existing knowledge and experience." 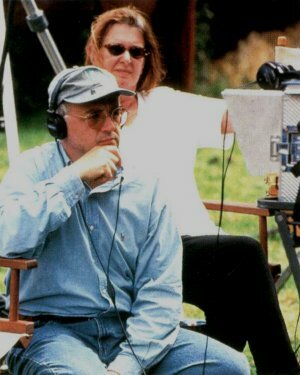 David was very closely involved in the casting of Jonathan Creek, and had Caroline Quentin in mind for Maddy when he wrote the scripts. "She's a wonderfully instinctive, funny actress who oozes audience accessibility, which is incredibly important." "Casting Creek was more tricky and we spent the best part of a year scouting round for the right person. There is a strong humour / comedy element here in what is essentially a drama series, and for that element not to get lost, you need people who know about 'funny'. But not to the exclusion of everything else." In the end it was Susan Belbin who suggested Alan Davies for the role, after seeing Davies rehearse for a sit-com for the BBC. David's angle on the traditional murder mystery is different to most of the murder mystery shows currently shown on television. The emphasis is not so much on who did the murder but how they did it! The resulting show, while a murder mystery, does have a slight comic tilt to it making for extremely entertaining viewing. It's no wonder then that the BBC commissioned a 2nd series before the first one even aired in the UK. David is a very hands on writer, and has become an exectutive producer of the show. He is involved with casting decisions as well as rehersals, filming and editing. "The Millenium - what's to celebrate there? Another thousand years - gone, just like that." But we had to cut it....for time!